Hi Friends, it's Carol here today. Nothing takes me back to my beloved New England Autumn like a flat bed truck filled with baskets of the season's harvest. The apples in New England cannot be beat and there's nothing like picking your own pumpkin right out of the pumpkin patch and loading it all up in an old truck to take home and enjoy. Just love this awesome CottageCutz die. This truck was piece together after cutting all the elements out with cardstock. I distressed the truck with green ink and it is the same ink I distressed the paper in. It's Studio G from Walmart but it doesn't have a color number or name on it. It's the darkest of the three green inks they carry in the 97 cent bin-I've been raiding it lately. I happen to love those little pads of ink-they're juicy! To make my background I used a simple evergreen tree and stamped the white cardstock with this green ink and then die cut the pieces. My paper is from K & Company. The autumn sentiment is something from my stash. I used both the large round and large scallop spellbinders die. The scalloped borders are a Martha Stewart punch I had for a long time and I think this was the first I used it. I stickled my edges with crystal stickles and this was a breeze to make. I really loved piecing this together! Here are the CottageCutz dies are used. Isn't it great when dies are so versatile. 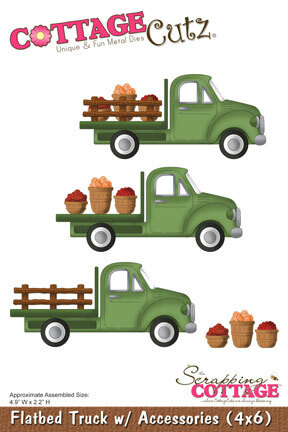 This truck would look festive with one of the tree dies in the back bed for a Christmas look. You could even tie some red little bows on the wooden bed to give it a decorated Christmas look. Thanks so much for stopping by. I really appreciate it and hope to see you again real soon. great themed card. Nice details on this card. 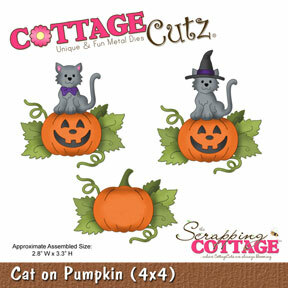 Awwww Carol I love what you did with the CottageCutz Truck, its super AWESOME hun, and love the pumpkins tooo!!!! Beautiful job as always sweetie!! Enjoy your weekend! !